How To Create Rental Agreement Online? Jharkhand, also known as the mineral storehouse of the country, is one of the fastest growing economies. Being rich in various minerals makes it home for many small and large scale industries. People move to new places for various reasons including job search, education, marital reasons, etc. It doesn’t matter if you are a working man or a student or a family person looking for a place to move in, you can’t escape from creating a rental agreement. And creating a rental agreement has now become so much simpler with the assistance of LegalDesk.com. A rental agreement is a contract that is set up between the landlord and the tenant whereby the landlord gives the tenant the right to occupy the residential premises. It is always better to have a rental agreement in case a dispute comes up in the future. Below is the procedure to create rent agreement online. Draft a rent agreement online at LegalDesk.com by clicking the button provided at the end of this page, by filling out the details of the landlord, the tenant and the property to be rented. The agreement is to be signed by the landlord and the tenant in the presence of two witnesses. Take the document to a sub-registrar office to get it registered. Rent agreement registration is always recommended as it helps in case of any future issues. Registering your rental agreement ensures the authenticity of the document and also helps in the prevention of fraud. Normally, notarization of a rental agreement is not mandatory in India. But going to a Notary Public to get the document attested validates the information given in it. To get your document notarized, once the document is signed by the landlord, the tenant and two witnesses, take it to a Notary Public and get the agreement attested. Accurate details: The details given in the document should be correct to the best of the knowledge of both the landlord and the tenant. Security Deposit: This is the amount that the tenant pays the landlord when the agreement period commences as a security. On expiration of the contract, the landlord has to pay the whole amount back to the tenant excluding any charges for maintenance caused due to the ill regard of the tenant. Lock-in period: Also known as the notice period is a specific period below which both the landlord and the tenant are not allowed to withdraw the agreement. Maintenance charges: Maintenance charges are normally to be paid by the landlord. If it is paid by the tenant, then he has the right to claim it back. Other clauses could be added too, as per the convenience and necessity of the landlord and the tenant. Registering your rental agreement is making the document legally valid. Normally, people tend to opt an 11-month lease agreement over the long term lease agreement as it does not require registration. However, registering the rental agreement carries more weightage in case a dispute arises between the landlord and the tenant in the future. There are three types of rental agreement. 11-Month Lease Agreement: This is the most preferred lease agreement as it does not require registration. This agreement expires at the end of 11 months and can be renewed if the landlord and the tenant wish to do so. Long Term Lease Agreement: This type of lease agreement involves the renting of a property from the landlord by the tenant mainly for residential purposes. The validity of the agreement could be anything more than a year. Commercial Lease Agreement: In a commercial lease agreement the tenant rents the property from the landlord mainly for business purposes paying a lump sum amount of cash. The tenant can personalise the agreement by adding important clauses as per the requirement of the business. E-stamping was introduced in Jharkhand in the year of 2014. It was introduced in a few districts first and was later spread all across the state. Now, the citizens have to just deposit the money in the bank and get computer generated stamp papers instantly. This ensures prevention of the circulation of fake and duplicate stamp papers and also helps you to get rid of the intermediaries and is also very time-saving. Now, it is very simple to create a rental agreement online. Online rental agreements are preferred over the regular ones, as they are very time saving and simpler. To create a rental agreement online, take a look at the following steps. 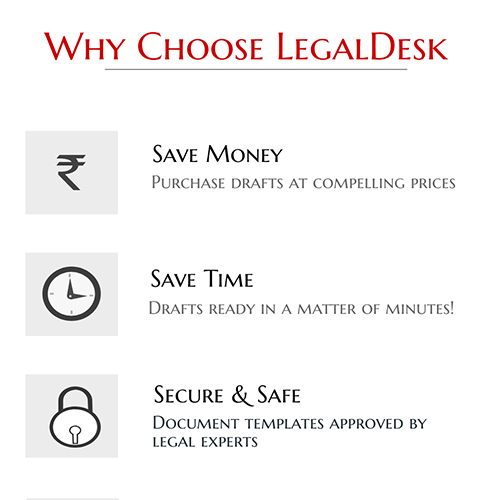 Visit our page, LegalDesk.com and look for our ready to customise, lawyer verified rental agreement. Fill in the details of the landlord and about the property to be rented. Print the document on a stamp paper of recommended value. Take the document to a Sub-Registrar office and get it registered. Besides online rental agreement, we also offer other revolutionary products such as Startup package, Online Will, Name Change Package, etc. Do visit our page and have a look at our list of ready to use legal documents drafts and get to know about our different products that you might be interested in. To create rental agreement, click the button below and get started. There are 0 comments on "Now Create Rental Agreement Online In Jharkhand".